What gal wouldn't love to receive this trendy pink polka purse manicure set favor? They make affordable, fun, and useful wedding bridal shower favors and diva birthday party favors. The stainless steel implements in these purse favors are solid - you could by each one on their own for the price of this entire set. 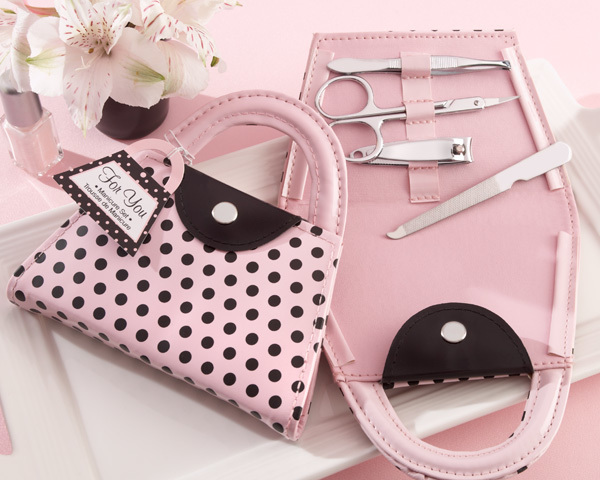 The set includes nail file, scissors, clippers, and tweezers and fits perfectly in the pink and black polka dot purse. Attached is a charming purse shaped 'Thank You' making for the perfect presentation. Each purse favor measures 5 1/8" x 5 1/2". Orders take 7 business days to fulfill personalized orders. Please add ship time from GA.